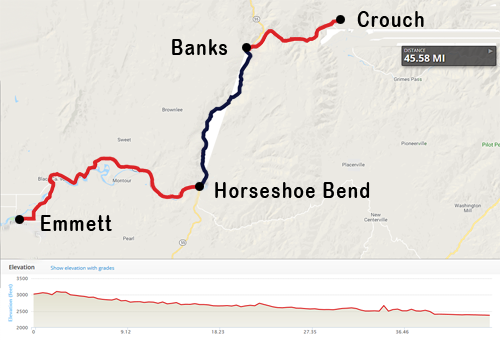 From the mountains of the Boise National Forest to the valley along the Payette River we go on to Day 3. 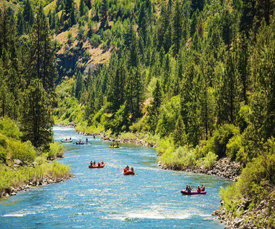 However, you will not only get to experience this breathtaking scenery from your bike, but you will have the opportunity to raft down the Middle Fork Payette, one of the most popular river trips in the state, (this trip is included in your registration). 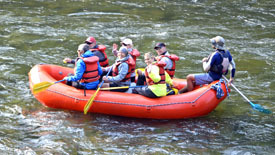 The morning will start with an easy 9-mile ride to Banks, where Cascade Raft and Kayak Company and their professional guides will be waiting to give you a brief orientation before helping you into a raft. This is a moderate family type river trip which is approximately 8 miles long and at the take out you will be shuttled 6 miles to Horseshoe Bend where your bikes and lunch will be waiting. From here you will ride continuing to follow the Payette River to our next overnight destination in Emmett. 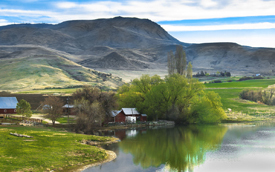 Emmett is the seat of Gem county, nicknamed “Gem of Plenty” for its plentiful harvests of fruit. 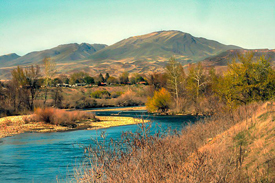 The town of Emmett was originally the community of Martinsville when Nathaniel Martin and Jonathan Smith decided to build a ferry to cross the Payette River in 1863. Emmett developed around this ferry site, which handled not only local trade, but also heavy traffic from the Basin Trail. Since then, Emmett has grown to be the center of many agricultural businesses for the entire state, the biggest industry being cherries. Since the 1930’s, the town has been celebrating the Emmett Cherry Festival which is complete with events, carnivals, and concerts. 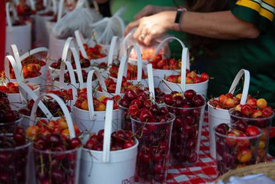 Although this occurs in June, there will be plenty of cherries and local fruit to enjoy and they won’t disappoint! We will be camping at Emmett City Park.